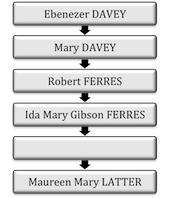 Ebenezer Davey (c1792 -1862), my great great great grandfather, was the fourth of my direct ancestors to migrate to Australia. This makes him the fourth of my ‘boat people’ and, at 61, the second oldest! Ebenezer and his brother Elijah appear to have been born in Truro, Cornwall in about 1792 and 1794 respectively. I have yet to identify their parents or any other siblings. In 1814, Ebenezer was a witness at Elijah’s marriage to Johana Randall in St Mary’s Truro.